The game was supposed to be a battle of the two best teams in the East. It was more like a battle of the two top teams, one heading north and the other south. 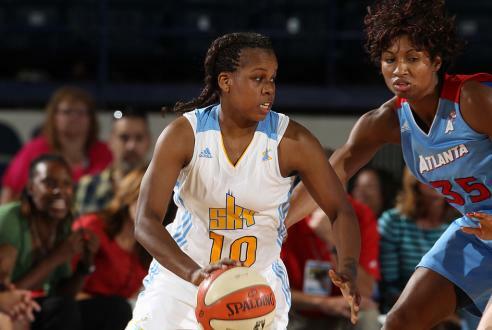 All-Star Epiphanny Prince scored 16 of her season-high 29 points in the fourth quarter to lift the Chicago Sky to an 87-82 win over the Atlanta Dream Friday night. The Sky have more history to write in the same season. The Sky need to win at Western Conference-champion Minnesota on Saturday in their regular-season finale to earn the top-overall seed and home-court advantage throughout the playoffs. “It’s going to be a huge game, we are going to prepare for it like any other game,” Elena Delle Donne stated. The Sky have clinched the Eastern Conference’s top seed for their first playoff appearance and went 14-3 at home. The Sky have won three straight and nine of 10. The Dream have lost three straight and seven of 10 and fell to 4-12 on the road. After leading by three after three quarters, the Dream shot 4 of 19 from the field in the fourth quarter. The Dream end a three-game road trip on the final day of the season against the San Antonio Silver Stars.